This week we found out four in ten Americans are unaware that Obamacare is still the law of the land. It is obvious that the “low information” people failed to get the message on Obamacare’s “free benefits”. Without the “low information” health consumers providing cover for Obamacare it is not surprising that Senator Reid is agreeing with Senator Baucus that health care is a ”˜train wreck’ if not implemented properly. My problem with Obamacare is that it costs me too much. 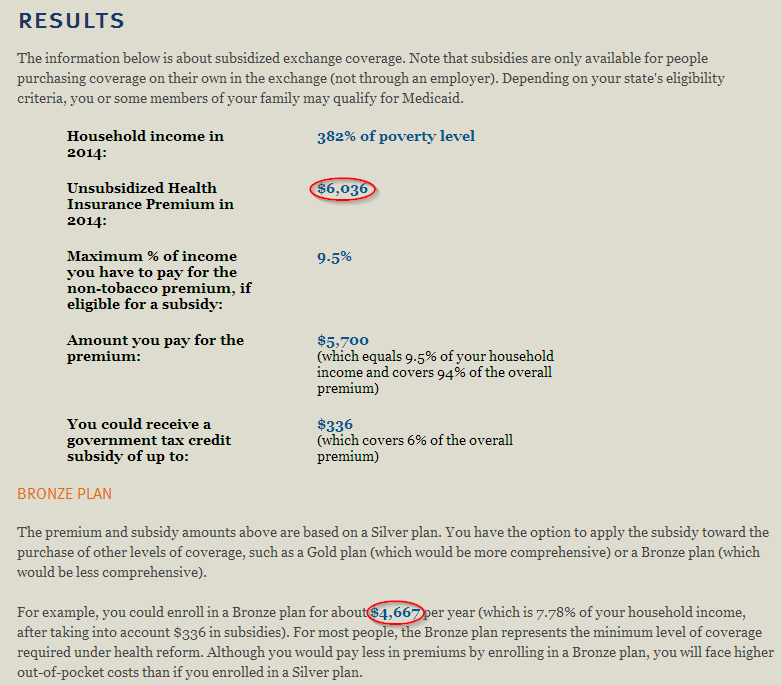 My health insurance premiums for this year are going to cost me about $4,692 and I am happy with my plan. Without Obamacare my health insurance premiums should be going up at the health care inflation rate. As a healthy family that has consistently poured more money into the health care system then we ever expect to get out, I feel we have done our job and our health insurance premiums should reflect our actual health care risk and our risk of associated with health care costs. For our family we have six more years playing this game before Medicare kicks in and we start playing a new game with a completely different set of rules. Most estimates for my health insurance premiums for 2014 have predicted a 55% to 85% increase based solely on community rating and pushing the people with pre-existing conditions into the individual health insurance market. 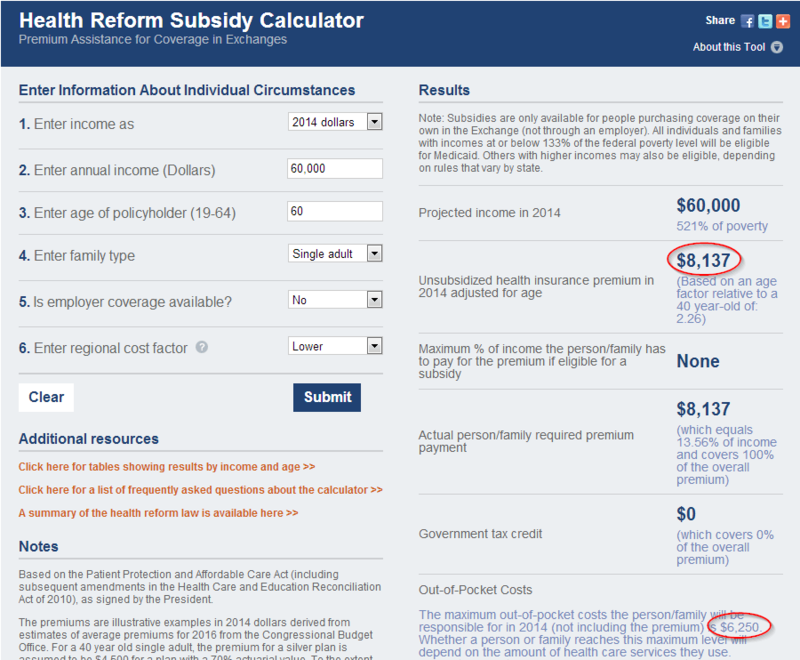 So at the end of April I was not surprised when I went to Kaiser’s Subsidy Calculator and got this estimate for 2014. This is 73% increase with a large increase in the out of pocket expenses even though I told the estimator that I had a single adult family. When I went back to the calculator to change the calculation to two adults, I got the number below. Wow, it is amazing what a week can do for your premiums! Obviously Kaiser has made a change in their calculator. This is probably the only situation in which you can say a 28% annual increase in health insurance premiums is good! I felt like I have been yelling for months, “Show me the money” and Obamacare has finally had a Jerry Macguire moment. This is the part of the movie where Rod has told Jerry that he will keep him as his agent but Jerry has has to do one thing for him, “Show me the money!” I have the same feeling toward Obamacare. My health insurance premiums are too high and Obamacare who is playing the Jerry Macguire part as my health care agent has finally started to recognize that healthy people are demanding either a much better deal or a new agent. As a “high information” health consumer I would love to hear how Kaiser arrived at this number since it is well below the amount I saw in the Massachusetts exchange two years ago.